TiVo Wifi N Adapters – In stock! It’s been a long, long time, but we finally got some TiVo Wifi N adapters in stock – part number AN0100. These are factory refurbished by TiVo! If you’re looking for the fastest way to get internet and network access to your Series3, TiVo HD, Premiere, or Series4 TiVo, this is it! You can order a TiVo Wireless N adapter from us on our website here, or through Amazon here. Quantities are limited here . . . Soon after TiVo added Android compatibility to the TiVo Stream, sales accelerated. And we ran out. And TiVo ran out. We’re happy to say, they’re now back in stock, in limited quantities. 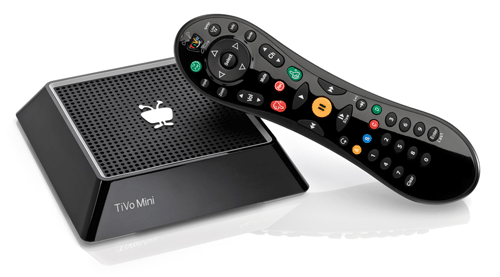 TiVo Mini with Lifetime Service is Currently $149.99 at WeaKnees! Starting today, September 7, TiVo Minis purchased directly from WeaKnees include Product Lifetime Service! This means NO additional monthly fee to use Minis. The price for this package of Mini and service is $149.99 – that’s a $100 savings over the pre-promotion price of $99.99 for the hardware and $149.99 for the Lifetime Service. If you have any 4 or 6 tuner TiVo DVR, you can use up to three Minis with it to see live TV, recorded shows, and much more, in other rooms. Minis require a hard-wired link to the main DVR. This can be ethernet or coax – but coax might require a MoCA adapter in some configurations. Minis are NOT compatible with Wifi. For a limited time, we have cut prices on ALL TiVo Premiere DVRs by $40 to $50. This includes stock units as well as upgraded models. This applies to Premiere, Premiere 4, and Premiere XL4 (Elite) models. Please note that due to the way our cart works, these may look like permanent price drops, but the discounts are only guaranteed through mid-August. All units are in stock!